The good news is that appliances make the everyday kitchen duties much more efficient—no more stocking fires, lugging ice to the icebox or having to wait for the fire to get going before you boil water for your cup of coffee. The bummer is that appliances can be an eyesore. While it's true that larger, commercial-grade appliances are en vogue right now (think 48-inch Wolf ovens and ranges), for many—these appliances disrupt the visual beauty of their cabinets, countertops and thoughtfully selected color schemes. Or, for others, it just seems like appliance aesthetics haven't improved all that much over the past few decades. Thankfully, Big Chill and other appliance manufacturers have taken this boring appliance bull by the horns so you can design a vintage, eclectic or a more personalized kitchen with appliances you love to look at. The folks at Big Chill offer three different lines: Retro, Classic and Pro. So, even if you aren't interested in the 1950s curves and bubbles, you'll still be able to add some stylistic interest to appliance selections. Then, there's the size factor. The spectrum of large kitchen appliances are available in standard, as well as smaller, models for studio or small kitchen spaces. There's even a "slim size" option for fridges so you can fit a larger fridge into that smaller nook space after all. Right now, there are typically three options when it comes to appliance colors - black, white or stainless. There are exceptions, but they're rare. Integrated appliances are always an option, but those can be a little overwhelming in larger kitchens where more cabinetry faces can mean too many cabinet faces. 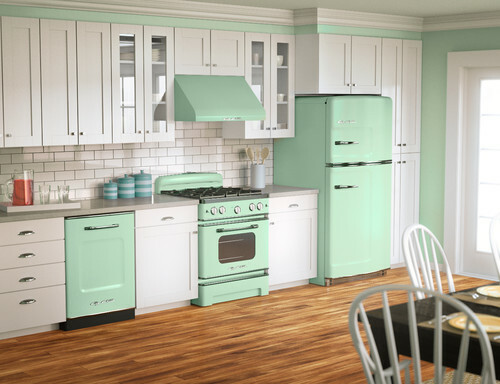 Big Chill appliances come in nine - NINE - different color options - including pale pastels and bright colors that pop. Plus, they allow you to go even more individual, by choosing one of 200+ custom colors. 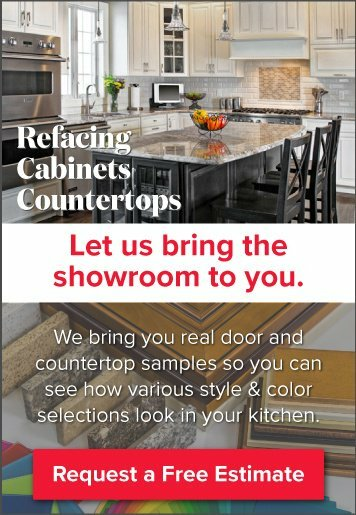 We love to sell Cambria Quartz countertops because we love supporting "local" designers and manufacturers. Big Chill appliances are designed, manufactured and distributed right here in the United States, too. In fact, some of their products are built, assembled and shipped from our own Pennsylvania - others are made in Colorado. Here are some examples of how Big Chill appliances can work with any design style. Their Retro appliance line is like taking a snapshot of a post-war kitchen with the addition of contemporary technology and efficiency. The colors and lines are a flashback, but things like the induction cooktop and convection oven options are the tip-off that these aren't your grandma's appliances. Take a peek into this Big Chill Retro Kitchen, featured on Houzz, where San Diego homeowners went all out, choosing Jadite Green appliances and trimmings. Their Pro Line is defined by modern lines and designer colors. You still get all the benefits of custom-colored appliances but you don't have to do it in Cleaver Family style. Instead, the clean angles and lines will compliment your own modern kitchen design preferences, but give you that burst of color or eclectic style that keeps it from being boring. The Classic Line blends the uniqueness of the retro designs with the contemporary elements of the Pro line to meet you in the middle. 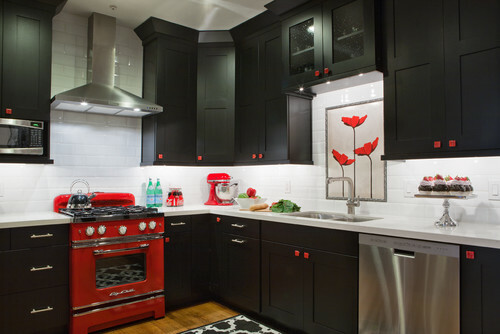 Look at this eclectic Black-and-Red Kitchen in Atlanta, where the Classic stove is the visual focus of the eye-catching design. One more thing before we sign off; there's no need to go Big Chill all the way. Even a single one of their appliances can pack a powerful design punch in a newly built kitchen. 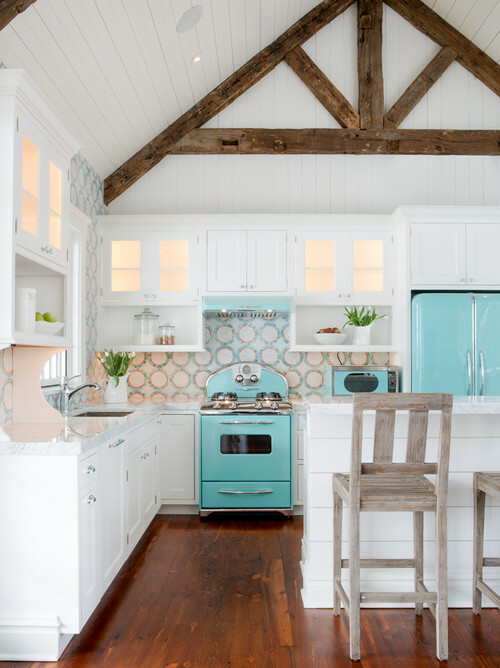 Look at this Churchill Place Kitchen, where the Retro Fridge is a bright spot of color in a fun, farmhouse style design (note how the island is painted differently than perimeter cabinets, proving two cabinet colors work excellently in the same kitchen. Interested in learning more about the ways Big Chill or other creative appliance designers can add function, efficiency and a whole lot of style to your upcoming kitchen remodel? 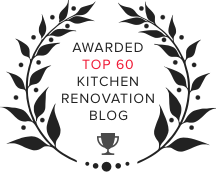 Visit us here at Kitchen Magic and work with a design team that knows all the tips and tricks to achieve the one-of-a-kind kitchen of your dreams.